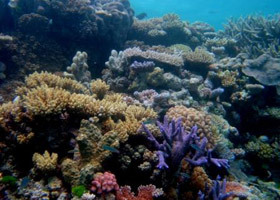 Conserving the nation's coral reefs cannot be accomplished by domestic efforts alone. Our coral reefs are ecologically connected to those abroad. Additionally, the most significant threats they face—climate change and ocean acidification—are global in nature. Strengthen local and national capacity to reduce the impacts of fishing and pollution on coral reef ecosystems.